We all love to play pickleball because it’s fun, but sometime the additional benefits of playing get overlooked. 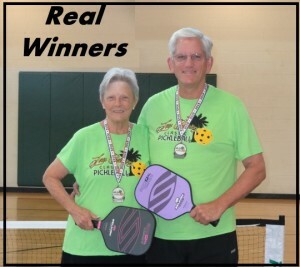 Here is another great example of winning at pickleball. Chris and Jim Cooke are two of the most recent 100 Mile club award winners at Abby Grubbs’ Pickleball Mile Club. Chris just logged her 100th mile playing pickleball this week and here is the story she sent in to Abby. I have completed my first 100 miles!! I started playing last June after attending a tournament with my husband in Madison, Wisconsin. Since then I have lost 30 lbs. and have been playing several times a week. We have combined this exercise with eating about 1200 calories a day. I have been diabetic for about 25 years and this fall was able to stop one of my medicatins and cut back on another. I also have been able to buy all new clothes!! Last August we drove from Kentucky to Seattle, cruised to Alaska, then drove back to Kentucky. We played pickleball all the way there and all the way back! Soon we will be driving to California and back and plan to play all both ways again! We are meeting so many great players and great people and we enjoy having something that we can do together and share at this point in our lives. I will be 70 next year and Jim will be 68. We are going to attend the senior games in Minneapolis in July and hope to have a good time and play well. this past weekend we particicpated in the Low Country Classic in Sun City, Hilton Head, South Carolina and won silver in our age group and skill level. It was unexpected and exciting. 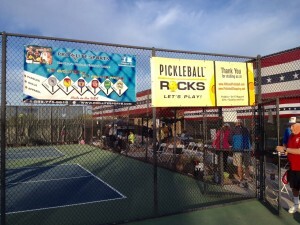 Thanks to you and Pickleball Rocks for all you do!! NOTE: The Pickleball Mile Club rewards players for introducing pickleball to new players plus it rewards players for playing. 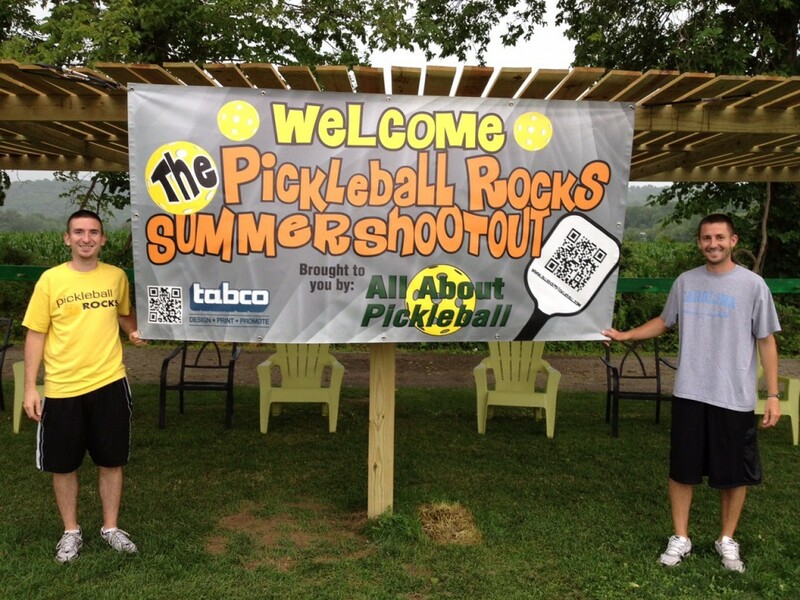 So what does having a great pickleball tournament mean? Well, have you ever attended a professional tennis tournament or been to a professional baseball, basketball or football game? Those events are fun for both the players and the fans, plus the sponsors and vendors too. It is a total experience. It isn’t just inviting a few players to come and play and that’s that. Having been a tournament director many times, I can certainly sympathize. Tournament directors have taken on a big task. Their plates are full and their checklist is very long. After many years, I’ve also come to realize there are four critical components to holding a great pickleball tournament. Unfortunately a lot of tournaments don’t understand these four building blocks, therefore their events end up on the “average or simply ok” tournament list. They usually don’t grow, and many times cease to exist altogether after a year or two. What happens, is the tournament directors and their support staff don’t truly understand that each foundational piece is equally important. And so they tend to put a lot of emphasis on one particular area while neglecting one or more of the others. And that leads to a less than stellar tournament. This includes things like having a great playing venue or in some cases simply a good playing surface while using a carefully chosen correct ball. It includes the looks of things when the players arrive. Does it look like a fun, great event? Are the courts numbered and signage in place for your check-in desk and hospitality area? Are there sponsor banners hanging on the courts? Are there vendor booths open and ready to greet them? It includes things like, making check-in simple and quick, plus making it easy for players to know when and who they will be playing and keeping them properly hydrated. Heck, last summer we even brought in an air conditioned tent for our tournament players to relax in. Do you think they want to come back??? And very important, it includes having good, equal competition. Players don’t like to drive or fly the miles to get to a tournament, only to get smashed 2 straight matches and go home. Also, most players don’t like to breeze through a bunch of 11-0 games either. Neither situation is fun. Besides player registration fees, sponsors are the lifeblood to having the finances to pull off a great tournament. Therefore you should approach and treat your sponsors like gold. A lot of tournaments merely go with their hand out, asking companies and businesses to give them money. These businesses are hit up for money many times throughout the year and their resources do have a limit. When you approach a sponsor, what can you provide them in return for their dollars or gifts? Your sponsor committee should be brainstorming months ahead of time to come up with perks, advertising and exposure benefits that can be offered to the sponsors in exchange for their financial support. Win-win wins every time. Treat your sponsors well. With literally hundreds of tournaments now on the yearly schedule, players have many choices in which events to play. Part of their experience is having something to do while waiting patiently for their next big match to be called. This is where having a great vendor area is so important. 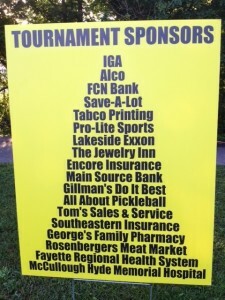 But, much like when looking for sponsors, tournament directors don’t realize that vendors have hundreds of choices in which tournaments to attend or support too. Many tournaments call or email vendors merely looking for a handout for their tournament bags or raffles. They don’t realize that those seemingly small requests all add up.Vendors greatly appreciate it, and will have a much greater likelihood of supporting your tournament when you approach them with something in return. Your vendor committee, just like the sponsor committee, should be bending over backwards to come up with ways to make your vendors feel appreciated. They are businesses just like your sponsors, so anything to help them gain exposure and marketing will help. Hang a banner for them. Do an occasional announcement or public thank you. During the actual tournament, doing things to make them feel special will greatly increase your chances of having them support you again. It could be something as simple as bringing them a bottle of water or snack or maybe offering them a simple free meal at the lunch stand. Again, there are all kinds of ideas out there, but in the end, win-win wins. Treat your vendors well. Operations for a tournament includes a lot more than I can cover in this short article. But essentially it is all the things that make the tournament run smoothly. It is the computers and monitors. It is the water station. It is the hospitality area. It is the referee desk. It is someone to clean the courts, check the restrooms and train and prepare all your referees. There are many aspects to cover, and all are equally important, but the main point here is to break all your operational tasks down into a checklist and have adequately staffed committees for each task. The more the merrier, and the easier it is for everyone, especially your tournament director. So, having a great tournament isn’t just about getting a few players to pay and play. 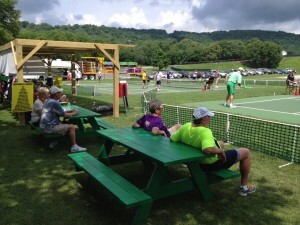 Holding a great pickleball tournament is about creating a great overall experience for everyone involved, which includes your players, your sponsors, your vendors, your spectators and everyone on your tournament operations team. So we certainly welcome your feedback and comments on this topic. Hope your next tournament is a highly successful one. DISCLAIMER: I wrote this article for those tournament directors and their teams who are striving to build great overall, professional feeling pickleball events. For small local or club tournaments, it really is just all about getting some players together and having some fun.